The world is invited to help discover a potential new, icy follow-on destination for NASA’s New Horizons spacecraft, using the Ice Hunters website. New Horizons is currently en route to make the first flyby of the Pluto system, and is then capable of exploring additional bodies still farther out in the Kuiper Belt. Through this citizen science project, the public can help scientists search through specially-obtained telescopic images for currently unknown objects in the Kuiper Belt. Along the way, they will also discover variable stars and asteroids. Ice Hunters is a Zooniverse citizen science project. “The New Horizons project is breaking new ground in many ways,” says mission Principal Investigator Alan Stern, of the Southwest Research Institute. “We’re flying by a new kind of planet, we’ll be making the most distant encounters with planetary bodies in the history of space exploration, and now we’re employing citizen science to help find our potential extended mission flyby targets, perhaps a billion kilometers farther than even distant Pluto and its moons. On the outer edges of the solar system an icy body lurks undiscovered, orbiting on a path that will just happen to carry it toward a potential rendezvous with the New Horizons spacecraft. This mission is on course for a 2015 flyby of Pluto, an encounter that begins New Horizons’ exploration of the Kuiper Belt. After visiting Pluto, the spacecraft will have enough fuel remaining to change its course to fly toward at least one and possibly two Kuiper Belt objects in the outer solar system – an object the Ice Hunters website is designed to find. The expected date of the KBO flyby will be between 2016 and 2020, depending on the object chosen and its distance from Pluto. 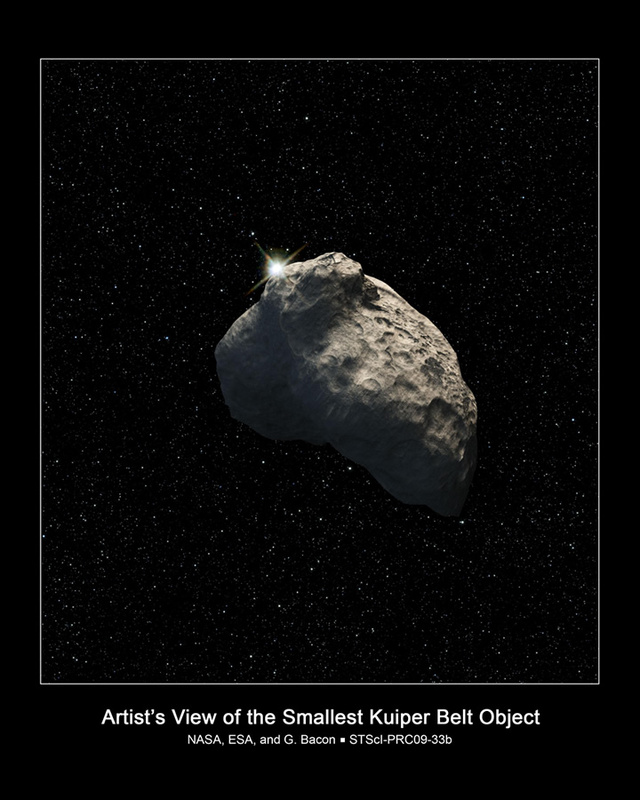 The Kuiper Belt, a region of the outer solar system extending past Neptune, contains small or “dwarf” planets; these are icy objects of a variety of sizes up to thousands of kilometers across. The first KBO other than Pluto was only discovered in 1992, and the KBO population is still not well mapped. Ice Hunters will do its part to study one small slice of the Kuiper Belt as it looks for an object along New Horizons’ trajectory after its Pluto flyby. If that object can be found, it will become the most distant object ever visited by a spacecraft from Earth. 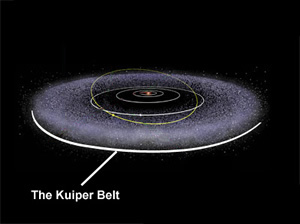 Diagram of the Kuiper Belt's location in the solar system; the yellow line marks Pluto's orbit. Using some of the largest telescopes in the world, scientists have imaged that region, producing millions of pictures that could contain images of the rare objects that are orbiting toward just the right location, along with many other small worlds on different trajectories. Ice Hunters users will be charged with marking these moving targets for follow-up examination. The images contained in IceHunters.org are “difference” images, created by subtracting observations taken at two different times. By subtracting the two images, scientists can mostly (but not entirely) remove the light from constant sources like stars and galaxies. Left behind are the things that move or vary in brightness: Kuiper Belt objects, asteroids, and variable stars. Since the stars never subtract off perfectly, the images appear messy, and computers can’t be trained to find objects as effectively as a people can. The search team will use the millions of mouse clicks made by Ice Hunters users to identify objects moving on orbits that New Horizons might reach. "When you're looking for something special in masses of messy, real-world data, sometimes there's no substitute for the human eye, and Zooniverse Ice Hunters will put thousands of eyes to work on this important job,” says John Spencer, of Southwest Research Institute, a member of the New Horizons science team who is coordinating the search effort. New Horizons launched in January 2006, and is the first NASA New Frontiers mission. It tested its instruments during a 2007 flyby of the planet Jupiter, and scientists now eagerly await its July 2015 flight through the Pluto system. With this encounter, the U.S. becomes the first nation to visit all of the classical planets. If approved by NASA, the extended New Horizons journey to one or more other (and far, far smaller) targets in the Kuiper Belt will allow scientists, for the first time, to study up close the diversity of characteristics seen among Kuiper Belt objects. The Ice Hunters project was produced at Southern Ilinois University Edwardsville as part of the Zooniverse, a collection of websites administered by the Citizen Science Alliance. More than 400,000 Zooniverse volunteers are already making important contributions to such diverse topics as the classification of galaxies in Hubble images, reconstruction of historical records of Earth's weather, and analysis of close-up pictures of the moon's surface. The public is invited to become a part of this and all other Zooniverse projects at Zooniverse.org.